The metaphor of the "left-brain"/"right-brain" divide has permeated pop culture as one of the defining dichotomies of how we think about and describe ourselves. 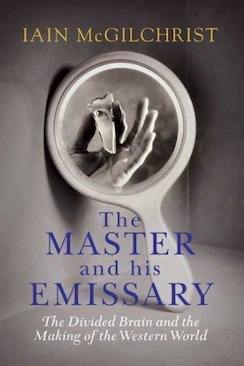 But this metaphor is rooted in a number of neuropsychological realities of how our brains operate -- the right hemisphere (the "master"), with its flexibility and capacity for empathy and abstraction but lack of certainty, and the detail-oriented left (the "emissary"), with its preference for mechanisms over living things, its inability to see past the literal, and its propensity for self-interest. In The Master and His Emissary: The Divided Brain and the Making of the Western World, the product of 20 years of research, renowned psychiatrist and writer Iain McGilchrist delves into the world of difference between our two hemispheres and argues that the formal structures of modern society significantly -- and dangerously -- prioritize the left brain, resulting in a culture shackled by rigidity and bureaucracy, driven by self-interest, and ultimately incapacitated by its own imbalance. In this lovely sketchnote animation by The RSA (whose previous animated gems you might recall), McGilchrist talks about the science and philosophy of his work, and makes a passionate case for reprioritizing the right hemisphere. This organ, which is all about making connections, is profoundly divided ... and it's gotten more divided over the course of human evolution. Provocative and fascinating, The Master and His Emissary will give you pause -- 600 pages worth of it -- about the origin and making of today's dominant worldviews, both ours as individuals as those of our collective cultural narrative.